I have been receiving a lot of attention and questions about my technique "Square-agonals" ever since my first book was released. My technique has now been published in three quilt books and 12 patterns. So I have created this page to list all the reviews and publicity links for your information and answers. However, please feel free to contact me personally if you need any additional information or have any questions about the book, technique, or booking events. reviewed by the SewCalGal Blog! An article published by Landauer Publishing. Some great ideas to utilize my newest book "12 Easy Pieces" in your quilt shop. My new book "Square-agonals; 12 Easy Pieces" was mentioned in te December issue of Electric Quilt Newsletter. I use EQ7 to design all my projects! I am now an Electric Quilt artist! Take at look at my article on EQ! "I Have A Notion", the popular blog by Kelly Jackson, again posted a review and photos from Fall Market in Houston on my "Square-agonals" book. What a delightful lady! online Quiltposium Magazine by Sew Many Places. Click on the link and enter your email address. My article is on page 68/71. Or you can read the article below without photos. Landauer Publishing Company just released their newsletter featuring two of their authors, myself and Liz Kettle. The article describes out books and current activities. 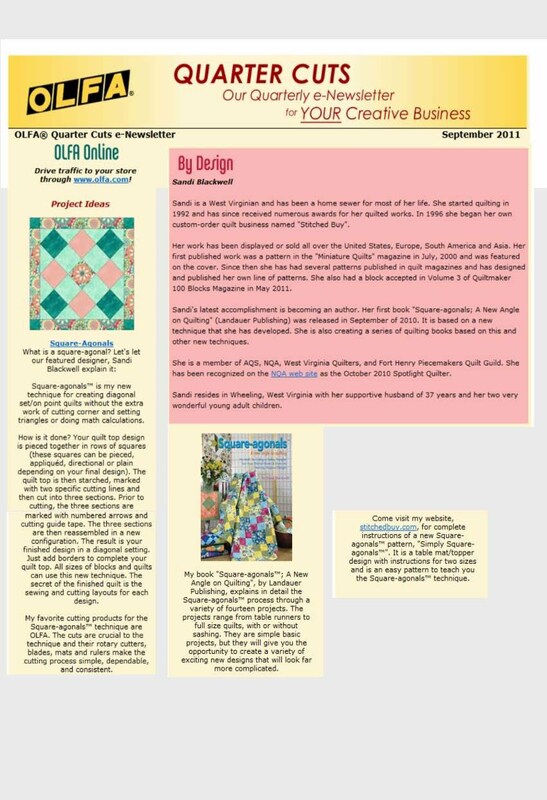 See my article on "Square-agonals" in the new Quiltposium Online Magazine, Summer 2011 issue. Click on the link and enter your email address. My article is on page 136/137 and information on my cruise in on page 138/141. by Munaiba Khan from Australia, along with a free copy giveaway. Thank you Munaiba! "I Have A Notion", the popular blog by Kelly Jackson, just posted a review and photos from Fall Market in Houston on my "Square-agonals" book. She is an energetic and delightful person to meet. Thank you Kelly! I have a block in Volume 8 of Quiltmakers 100 Blocks!!!!!! Should be on newstands November of 2013! I was interviewed for the September 2011 OLFA Newsletter. An excerpt from the newsletter is shown below. I have had a block design accepted and published in the next issure of Quiltmaker's 100 Blocks! It should be on newsstands the first week of May, 2011! Here it is, the link and info to listen to my interview with Mark Lipinski on his radio talk show Creative Mojo! Follow the link to toginet radio on itunes. My podcast was aired on December 29, 2010. If you want to know how I got into quilting, this is my story. Bloom, Bake, and Create Blog, did a book review and book giveaway. Thank you BB&C! qb -So many quilting books, so little time...a blog that reviews new quilt books. the intelligencer story "Sewing Passion Leads to Book Deal"